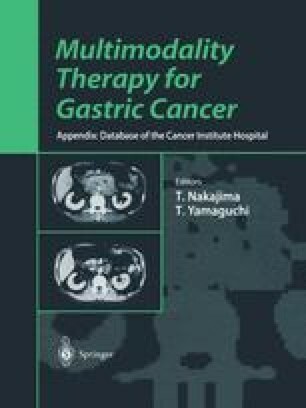 Gastric cancer is still a leading cause of death in Japan, and the most frequent cause of death from this disease is peritoneal dissemination. Intraperitoneal chemotherapy has been performed to treat peritoneal dissemination, but the treatment results remain poor [1, 2, 3, 4, 5]. The reasons for treatment failure are believed to be as follows: (1) the penetration distance of the intraperitoneally (i.p.) injected drugs into the submesothelial tissue is limited to a 2–3 mm [3,6]; (2) intraperitoneally injected drugs usually distribute unevenly because of the anatomical complexity of the peritoneal cavity ; and (3) complete elimination of peritoneal carcinomatosis with chemotherapy may fail in nodules larger than 3 mm because of the development of multidrug-resistant clones by mutation . For these reasons the treatment results for patients with peritoneal carcinomatosis remain poor. Consequently, thorough surgical resection of peritoneal dissemination is considered to be the only option for cure, although peritoneal dissemination cannot be completely eliminated with the usual surgical techniques because “invisible” cancer cells have already spread over the peritoneal surface outside the surgical field.